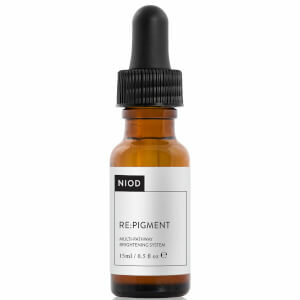 Ideal for sensitive skin types, the NIOD Non-Acid Acid Precursor 15% is an alternative treatment to acid-based epidermal resurfacing, harnessing bio-derivatives and amino isolates to effectively refine the surface layer without causing redness or inflammation commonly associated with AHA/BHA acids. Found to be non-irritating by an independent Human Repeat Insult Patch Test, the advanced ‘facial peel’ formula combines two forms of amino isolates that mimic the surface-regulating action of retinoids, while a bio-fermented oligopeptide delivers enhanced exfoliation over traditional alpha hydroxyl acids. 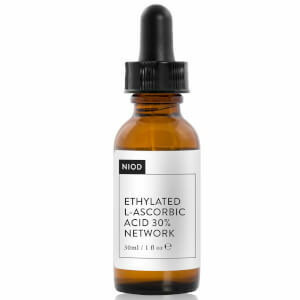 With the addition of a marine-based exopolysaccharide to minimise transdermal water loss, the serum effectively penetrates the surface of skin to leave it feeling renewed and replenished with an improved texture and tone. Apply a few drops at bedtime to the face avoiding the immediate eye areas. If used as part of a NIOD regimen, apply after CAIS and MMHC but before HV. If used along with ELAN, apply after ELAN. If sensitivity occurs, reduce application initially to every other night until skin builds tolerance. I cannot get over how good this is!!! 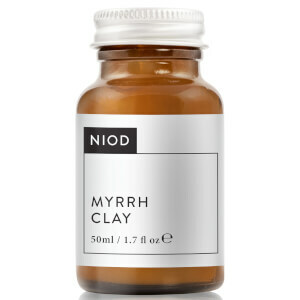 My skin has never really liked acids ... this is sooo much better!! So much better!! My skin is getting clearer and brighter... it’s a magical product!